I’ve been thinking a lot about creative ways to use quilling lately. And this past week was no exception! After I finished my tutorial on quilling paper eucalyptus and lavender, I was left with a bunch of stems on my workstation. I could have just stuck them in a vase and been done with it, but I decided to do what I would have done with loads of real eucalyptus and lavender. I worked up a simple, rustic door hanging! 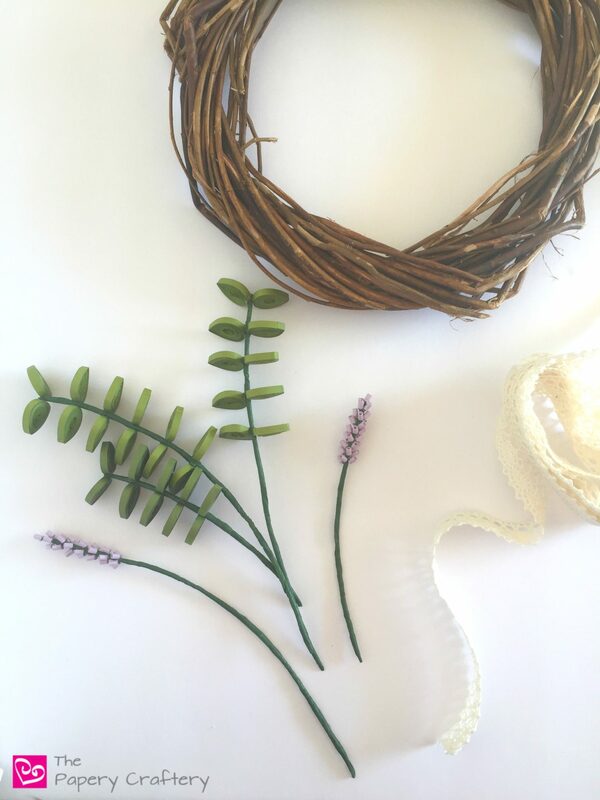 This week, I’m sharing some words on how to use quilling to make a wreath. First, I gathered a few supplies. 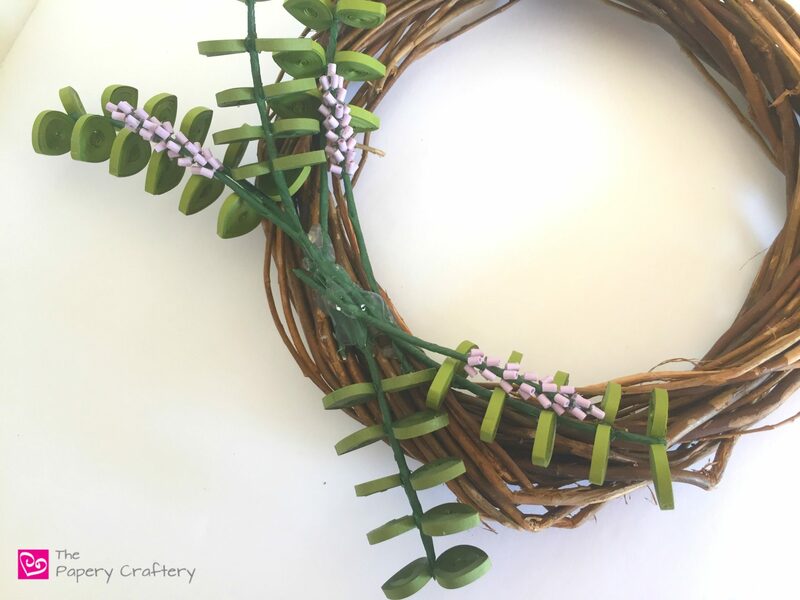 I had a plain willow wreath form that was about 8″ in diameter. They’re pretty easy to find in a craft store or online. I had an idea of the general shape I wanted to create with my stems before I started this project, so I knew I only needed a few of each type of stem. But, there’s no reason why quilled eucalyptus couldn’t be used all the way around a wire wreath form to make a sunburst wreath. I took a moment to lay them on top of my wreath form to make sure I would be happy with the finished product. Instead of going all the way around the wreath, I was looking for more of an off-center spray of greens towards the bottom. I wanted few eucalyptus sprigs to face outward, and after a few minutes, I had everything laid exactly the way I liked. Once you have all your stems arranged, start gluing! I recommend using hot glue here. It dries in minutes so you don’t have to hold everything in place. Don’t worry if it gets a little gloppy ~ all the glue will be covered in the next step! I found a spool of cotton lace ribbon last month when I was at the Dollar Tree picking up a few new things for fall. 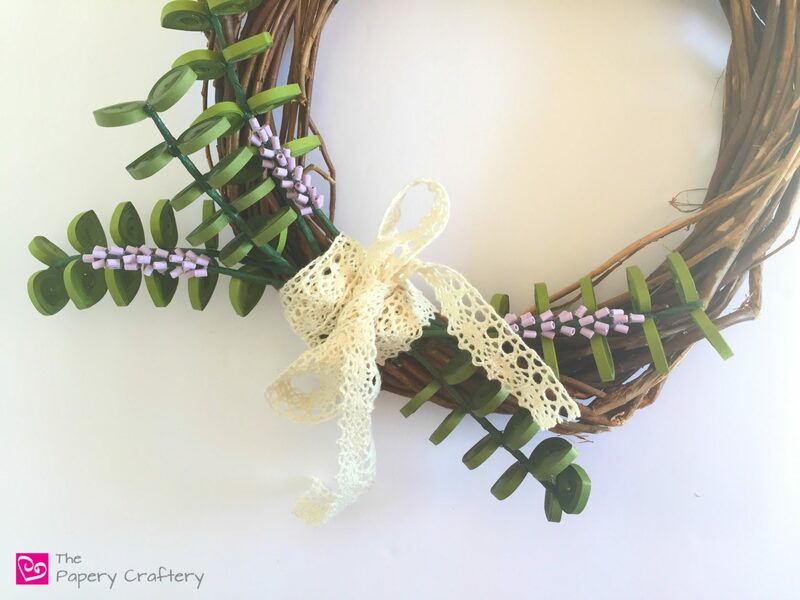 The cream color perfectly with the rustic vibe of the rest of the wreath elements. First, I wrapped it around the spot on the wreath where the stems met and were glued. After it was wrapped, I finished tied the ends into a bow. To make the hanger, I used the rest of the lace ribbon. 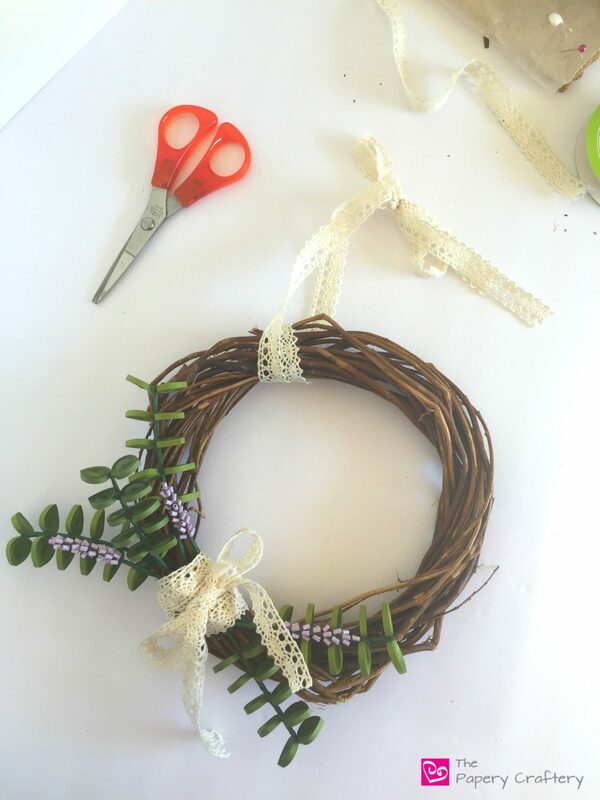 Just loop the ribbon around the top of the wreath and pull tight so it’s snug around the form. Next, pull the ends back towards the top and tie a bow. Because my wreath form is pretty bumpy, my ribbon hanger didn’t move much. But you might feel more comfortable adding a dot to glue to make it more secure. By all means, go for it! Since I already had the eucalyptus and lavender sprigs rolled, this door hanger really took about ten minutes. I think a lot of that time was waiting for my glue gun to heat up! One of the most fun things about figuring out how to use quilling to make a wreath is how customizable it could be! 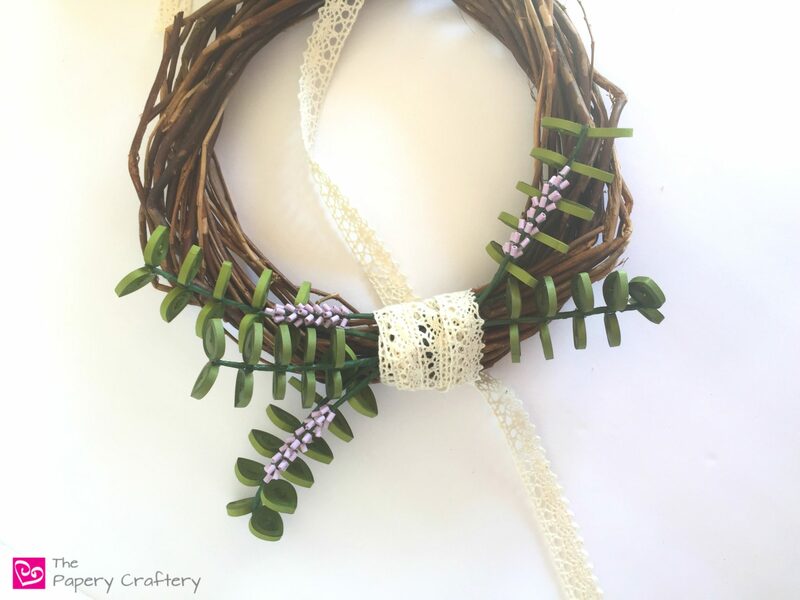 More or less stems, add some flowers, change up the ribbon ~ you can make this project uniquely you! 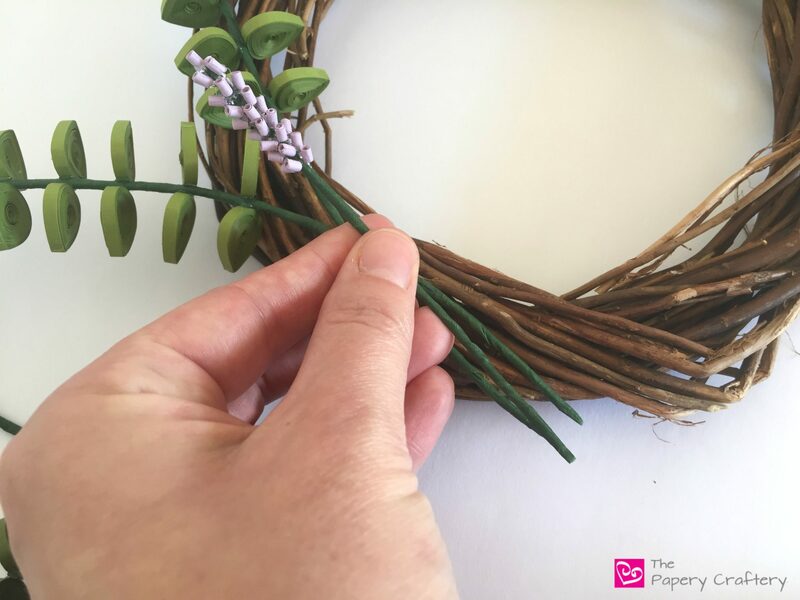 Do you have any thoughts on how you’d make your own wreath with quilling? Leave your ideas in the comments below! I can’t wait to hear all about them!